^ 1.0 1.1 1.2 Chamberlain, Peter; Doyle, Hilary. Jentz, Thomas L., 编. Encyclopedia of German Tanks of World War Two. Silverdale Books. 2004: 148. ISBN 1-84509-012-8. ^ Parada, George. 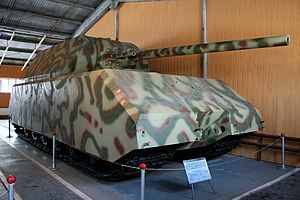 Panzer VIII Maus. Achtung Panzer. ^ Jentz, Thomas; Doyle, Hilary. Panzer Tracts No.6-3 Schwere Panzerkampfwagen Maus and E 100 Development and Production from 1942 to 1945. Panzer Tracts/Darlington Publications. 2008: 23. ISBN 0-9815382-3-1.